Containerized Storage | Huntsville Moving Service. 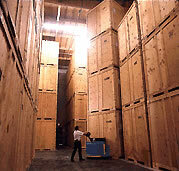 Huntsville Moving Service can store your furniture and valuables in our modern warehouse. Our prime location allows us to easily package moving or relocation services with your storage needs. When considering a storage company, you should keep in mind that using a single company to move and warehouse your posessions, to help keep logistics running efficiently. We can easily pack, move and store your belongings until you are ready to have them delivered, whether delivery is locally or across the country, or the world! Our warehouse is one of the finest in the area, providing a climate-controlled environment to keep your posessions dry and cool. We have 00,000 sq. feet of space, providing ample room for your needs whether it be a short term, or long term storage requirment. We also take pride in the security we provide our customers. You can be sure your goods are locked away, safely guarded until you are ready for them to be delivered.